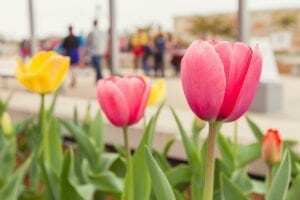 Cheery tulips in the Seasonal Display Garden provide a bright backdrop for spring events. What does it take to keep the beds around the Botanical Center enjoyable and attractive all year long? The generosity of incredible people in this community! Our seasonal display beds, which showcase three seasons out-of-doors and the holiday season inside the Botanical Center, are main attractions to our 800,000 annual visitors. Vibrant displays showcasing the flora of each season can be enjoyed just by driving by or through close examination of each bed. During the holiday season, vibrant poinsettias from brilliant red to creamy white fill the Botanical Center atrium and adorn the holiday train display provided by the Ozark Garden Railway Society. In the spring, daffodils, tulips, and other bulbs emerge as a promise that winter will soon give way to warmer weather. The summer growing season affords a colorful display of various plants with complementary textures and sizes. Cooler weather in the fall supports the addition of a rainbow of mums and pansies which can be maintained even as the temperatures drop and winter begins.